Guyana’s Ministry of Natural Resources on Friday said “intensified” efforts would be made to remove a mining raft, popularly called a draga, that has been blocking the main channel of the Mazaruni River, resulting in difficulties in transporting people and vital food and mining supplies. The ministry did not name the mining company, Crown Mining, but said the “responsible mining operator” and the Maritime Administration Department (MARAD), would be working to remove the draga. There is to be an emergency meeting on Monday September 19, 2016, convened between an advisory board of MARAD and the operator responsible for the sunken dredge, with a view to working out emergency modalities for the removal of the dredge. 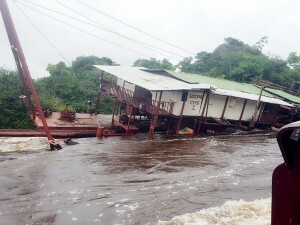 That vessel has been blocking the Mazaruni River channel in the vicinity of the Pirimap Falls for the past three months, but in recent weeks the situation has worsened because jet boats have stopped plying the route due to safety concerns. About 50 students from several Upper Mazaruni river communities have been unable to return to their secondary schools in Bartica since the beginning of the Christmas Term. Miners have also complained that food, fuel and other supplies have been running low. “The Ministry is mindful of the many complaints from the public and is committed to ensuring that this issue is addressed as soon as possible,” the Ministry of Natural Resources said in a statement. Reports are that the water level of the Mazaruni River of late has caused some difficulty in the salvage efforts. A draga is a motorized mining technology of a jointed metal tube mounted on a large raft with custom-builty metal hulls. The tube ends with a drill bit and a hydraulic pump. The tube is raised and lowered by steel cables powered by a truck engine mounted on the hulls and the alluvium from the river bed is passed over large sluices on the raft.